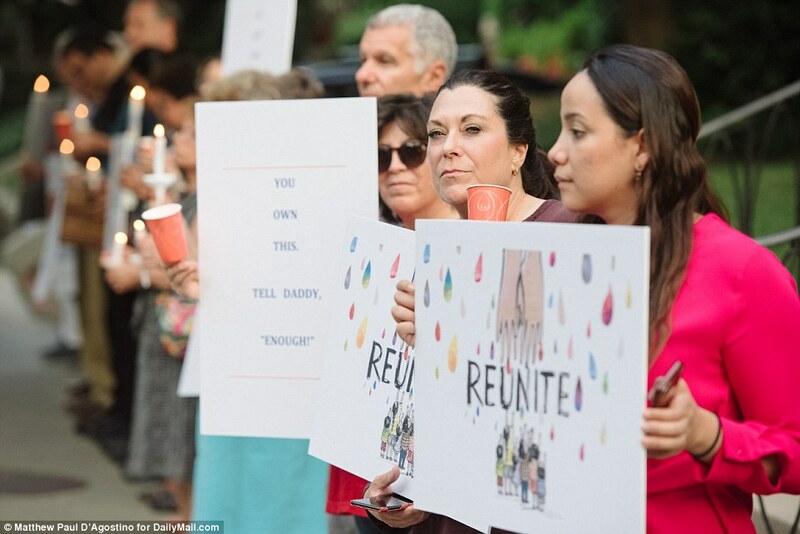 Ivanka Trump and Jared Kushner's neighbors gathered outside their Washington DC home in silent protest against the Trump administration's immigration policy and failure to reunite migrant children with their families. 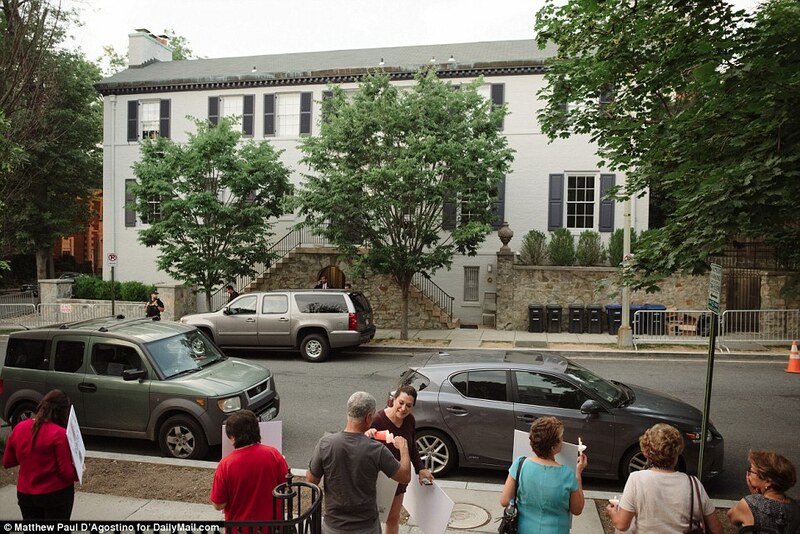 Dozens of people took the street outside the first daughter's $5.5million family home, in the upmarket neighborhood of Kalorama, on Wednesday evening. 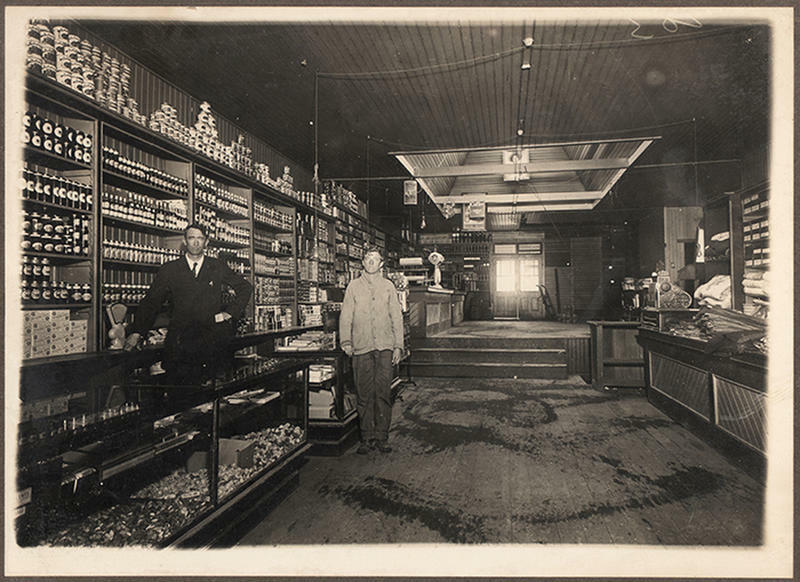 The wealthy Kalorama neighborhood, in the historically Democratic DC area, counts many prominent politicians and government officials among its residents. It was even home to the Obamas' post-presidency digs. 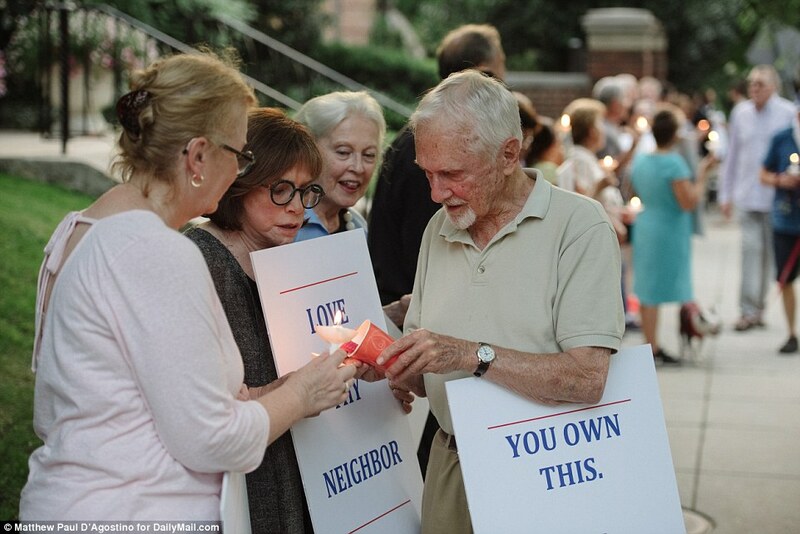 But this is the first time that homeowners have felt so strongly about an issue that they have taken to protesting outside one of their neighbor's front doors, according to Riley Temple, 69, who lives just a couple of blocks away from Jared and Ivanka. 'This is a first,' the retired lawyer and theology teacher told DailyMail.com. 'These were all Kalorama neighbors. Under normal circumstances we would never protest outside a home. But these are not normal circumstances. 'We shattered the custom because they have shattered civility. 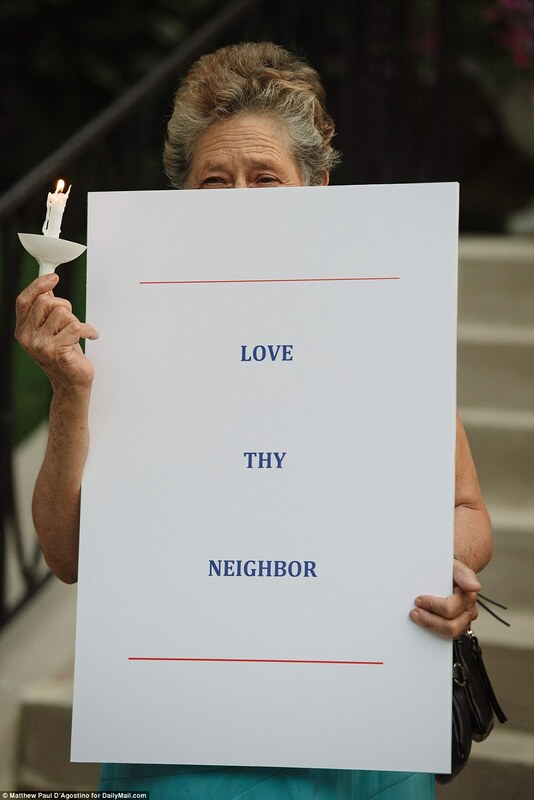 Temple was among the more than 30 local residents, and members of local houses of worship to protest against the 'continued separation of migrant families without any apparent or articulable reference for reuniting each and every family, and each and every child, with his or her parents. He added that he and other neighbors would often see Jared and Ivanka walking to synagogue, or their children playing in the park. 'People give them space,' he said, adding that the 'extreme' immigration policies meant that residents felt forced to act, protesting against polices they oppose at the home of an official, for the first time. The protest came just a day after it was revealed that the Trump administration wouldn't meet its federal court ordered deadline to reunite migrant families. 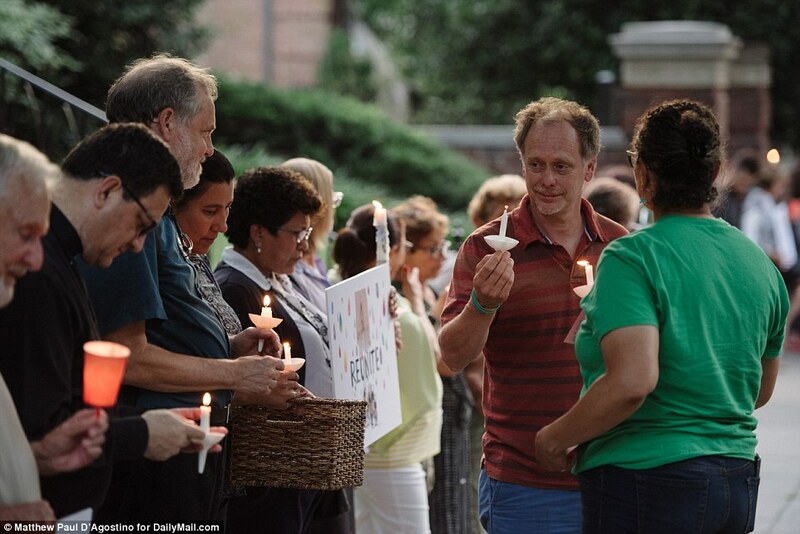 Jared had arrived home around 7pm from DC so was at the house when the demonstration kicked off around 7.50pm. It lasted a little over 40 minutes. Ivanka, who initially got home at 6.30pm, avoided the drama by stepping out at 7.15pm. She didn't even get a chance to change out of the dark, skirt suit she'd worn for an earlier visit to Capitol Hill, before her evening appointment. The mother and businesswoman did not return home again until 9pm at night, after the protesters had left. Trump's failure to reunite migrant families has sparked protests across America. A dozen people were arrested in Columbus on Monday in a protest against ICE and the separation of families at the Mexican border. This latest protest has a more peaceful tone, but will inevitably hit harder as it's Jared and Ivanka's own neighbors who are demanding they take action. 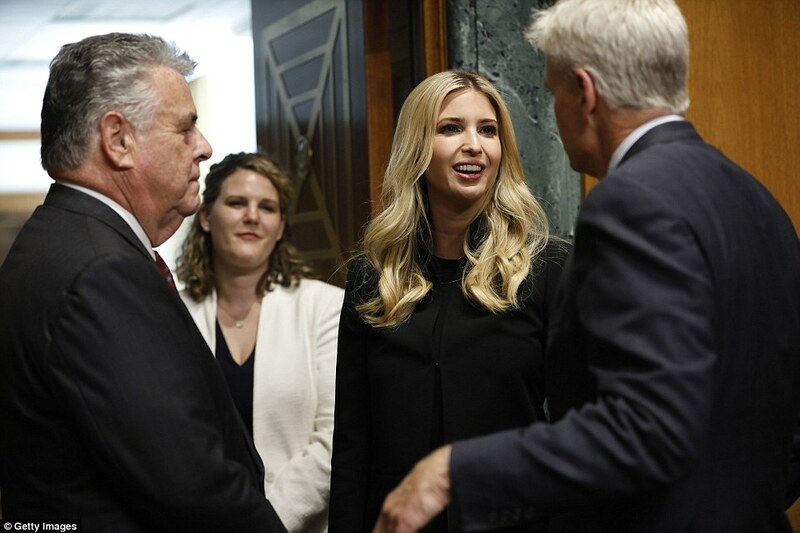 Earlier on Wednesday, Ivanka was in Capitol Hill for a Senate committee hearing on paid family leave. The first daughter is spearheading a program to introduce a six-week parental leave program linked to unemployment insurance. It gained some support at the hearing, from senators Joni Ernst (R-Iowa) and Kirsten Gillibrand (D-N.Y.) who said it was long overdue. Meanwhile, Ivanka's father's policy has continued to cause controversy. The zero tolerance policy has also sparked backlash against members of Trump's administration, with several key figures being confronted by members of the public in recent weeks. Sarah Huckabee Sanders was asked to leave the Red Hen in Lexington, Virginia, last month over her stance on gay rights and the immigration polices. Hard-line immigration advisor Stephen Miller saw his face appear on 'Wanted' posters near his apartment. Homeland Security secretary Kirstjen Nielsen got hounded out of a Mexican restaurant with chants of 'shame!' at the height of the child separation controversy. And former EPA administrator Scott Pruitt was confronted by a woman at DC restaurant and urged to resign 'before your scandals push you out'. 'We deserve to have somebody at the EPA who actually does protect our environment, somebody who believes in climate change and takes it seriously for the benefit of all of us, including our children,' she said in a video of the encounter. Pruitt resigned citing 'unrelenting attacks' on himself and his family, which 'have taken a sizable toll on all of us'. The controversy began after Attorney General Jeff Sessions announced in May that the zero tolerance was in full effect, even if it meant splitting families. It meant anyone entering the US illegally, even asylum seekers, were arrested and prosecuted. As their children could not be held in jail, they were separated and put in detention centers. Around 3,000 children were taken from their families at the border until intense pressure forced Trump to walk back the policy, briefly allowing children to be kept with their parents in jail, before returning to catch and release. U.S. District Judge Dana Sabraw, gave authorities 14 days to reunite parents with 102 children under five, and 30 days to reunite parents with all other children writing that the 'situation has reached a crisis level' and that the 'chaotic circumstances' were of the government's own making. But officials were forced to admit some families will miss the deadline. The administration says some of those parents have been deported, and eight have been previously released in the United States. While parents were criminally prosecuted, children were placed in custody of the Health and Human Services Department. Trump reversed course on June 20 amid an international outcry, saying families should remain together. On Wednesday, Trump conceded he'd missed the deadline, but said the solution was to simply tell asylum seekers fleeing their homes, not to come. Trump and his administration have faced a furious backlash over the immigration policy and Ivanka has remained incredibly quiet on the subject.